Environmental law conjures images of tug-of-wars with major corporations over pollution, challenges to U.S. Army Corps of Engineers decisions and fights over fracking. But how about working to ensure access to crawfish habitat in the Atchafalaya Basin on behalf of the Cajuns whose living depends on it? Defending the cause of small business owners like charter fishermen? Advocating for families trying to save wild horses they consider integral to their rural heritage? Student-attorneys in Tulane’s Environmental Law Clinic have tackled these kinds of cases, gaining real-world experience representing individuals and organizations before state and federal courts and agencies. Centered on administrative law and compliance issues, environmental law practice tends more toward complex litigation and less toward traditional trial practice. The focus is on careful research and preparation, persuasive writing and oral advocacy, negotiation strategy and—when necessary—trials. The clinic creates invaluable access to the legal system for its clients, giving voice to fence line communities and individuals most directly affected by permitting decisions and environmental hazards but without the resources to challenge often unlawful conduct. For example, this past year, the clinic was able to assist clients in obtaining rulings vacating permits on the grounds that the state agencies did not follow rules enacted to protect the public. Particularly, the courts found that the agencies failed to apply guidelines, consider effects on adjacent neighborhoods, or conduct a cost-benefit analysis. The clinic also helped negotiate a Clean Water Act settlement on behalf of clients challenging breakdowns in their sewage treatment system—including overflow of raw sewage on residents’ yards. The clinic recently toured the Maurepas Swamp, observing the state's wetlands loss. The Environmental Clinic has a deep bench. 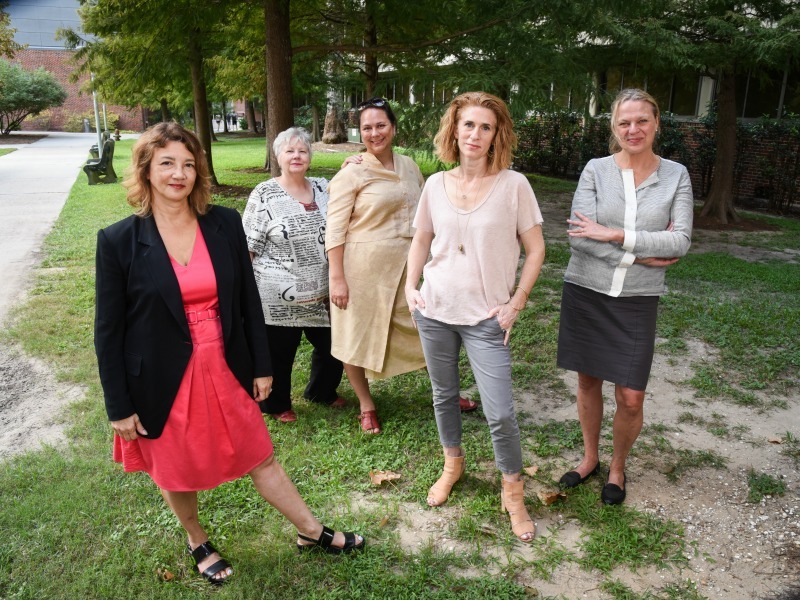 Clinic supervising lawyers and instructors have a combined total of nearly eight decades of legal experience, with nearly 50 years of that spent supervising environmental litigation at Tulane Law. Jordan and the clinic have received national recognition for representing citizens and environmental groups amid significant political and financial resistance. Jordan, a former prosecutor, assumed the directorship of the Tulane Environmental Law Clinic in 2017, having taught and litigated in the clinic beginning in 1996. Her experience spans the major federal and Louisiana state environmental and public access laws. Corinne Van Dalen has a total of nearly 27 years of legal experience and has taught in the clinic for nearly 14 years, handling citizen suits in federal courts under the Clean Water Act and Clean Air Act, air and solid waste permit appeals in state courts, and civil rights complaints focusing on environmental justice concerns. Liza Calderon has 20 years of legal experience in both the private sector and legal academia, spending 12 years in the clinic litigating a range of matters under the Clean Water, Administrative Procedure, National Environmental Policy, Clean Air, Resource Conservation and Recovery, and the Endangered Species Acts. Machelle Hall, a former archaeologist, has practiced law for 11 years, with seven of those spent litigating Clean Water, Safe Drinking Water, historic preservation, and NEPA cases in the clinic. Regardless whether students plan to practice environmental law, the clinic’s emphasis on client relations, legal writing, working with experts, interviewing witnesses, speaking in public hearings and advocating before courts and agencies, negotiating settlements, and developing case strategy provides student attorneys with highly transferable legal skills. Moreover, the clinic’s administrative law practice prepares students for an increasingly complex regulatory landscape. The clinic’s cases often involve the use of experts. Students have worked with a biologist to obtain stream samples to determine the impact from landfill discharges. They’ve also observed smoke testing that an expert performed to find leaks on an underground sewage system. Samantha Pfotenhauer (L'17), who spent a year in the clinic, said she entered the program hoping to improve her writing through drafting motions and other court documents. She received writing instruction but also learned skills for communicating effectively with clients and managing their expectations. The Clinic fundamentally instructs students on how to handle complex cases at a high level of professionalism, but the clinic’s cases are about people who often couldn’t afford legal help elsewhere. Though a long-running suit over a 30-year-old landfill built next to a historically African-American community addressed state regulations, permitting and zoning, the case ultimately was about the impact on health and welfare of residents. Under a settlement negotiated in 2017 by the clinic, the landfill operations are now prohibited within 300 feet of the community, instead of the 50 feet allowed under state law. Pfotenhauer said her perspective on a case involving the U.S. Army’s plan to remove hundreds of horses roaming the Fort Polk, La., training area changed after she visited a client, a retired state trooper who opposes the removal as another blow to the fading cultural heritage of Peason Ridge, where his ancestors lived and farmed. Jordan said the client connection is the heart of the Tulane Environmental Law Clinic experience. “To effectively advocate for their clients, our students need to get out of the office and into the communities,” said Jordan. “They need to understand the clients’ experiences and see the problems from various perspectives. To that end, students have toured the swamps of the Atchafalaya Basin, flown over the Mississippi River to see the extent of pollution from a coal terminal and traveled off-road with a longtime resident of Crossett, Arkansas, to investigate the effects of daily paper mill discharges on a local creek. The best legal work begins with a solid factual grounding,” she said.